Impulcity is one of the standout startups at The Brandery in Cincinnati. We finally got a chance to talk with Hunter Hammonds and Austin Cameron face to face about the disruptive mobile app they’re building. When someone who does what I do hears the words “location” and “discovery’ we automatically think FourSquare, Google Places, and checking in. We think the space is crowded. We think “sure you’ve got something different”. Well with Impulcity, Hammonds and Cameron have something different. As soon as we arrived at the Brandery Hammonds immediately set up the private beta on my phone and for the rest of the evening I got a guided tour on Impulcity right from the co-founders. After a night on the town, Hammonds challenged me and our co-founder Cameron Wright to name one event discovery mobile app, that served up local events, allows you to check into them, invite friends, and had a great UI. We couldn’t even name one, not like this. As you can see they have a great visual user experience. From the main screen you see a highlighted event in visual form and then a grid of similar pictures promoting events around you. The top featured event can be swiped from left to right so that you can see all the highlighted events. Once you’re in the event you can do a number of things which are all explained in easy detail. There are big inviting buttons for sharing, and what network you want to share with. There is a timeline feature for each event where people can chime in on their experience at the event and share pictures and text. While Impulcity is from Louisville and building at the Brandery in Cincinnati they’ve already got over a million events in their database that will populate in the same beautiful visual way. 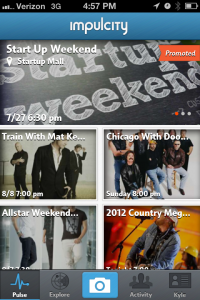 Impulcity says they help you discover, attend and interact with events around you and that’s certainly true. But you can bet on our road trip that we will continue to test and use Impulcity.